Anyone who visits his Wikipedia page will discover that clarinetist Ben Goldberg has an ongoing interest in playing with different groups, many of his own formation. 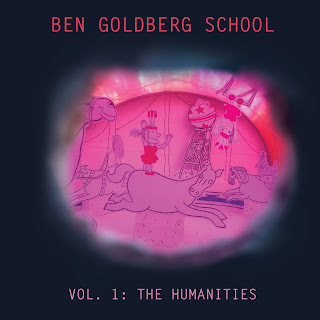 In January of 2012, one of those groups, called the Ben Goldberg School, gathered at Cressman Studios for its first recording sessions. “Cressman” is Jeff Cressman, who also played trombone in the group, along with Kasey Knudsen on alto saxophone, Rob Reich on accordion, David Ewell on bass, and Hamir Atwal on drums. Little by way of background has been provided for this recording, suggesting that even his choice of the group’s name may have been a prankish reflection on his earliest clarinet lessons. Nevertheless, there is much to enjoy in both the sonorities and the breadth of stylistic approaches that comfortably bridge the domains of chamber music and jazz. Indeed, the opening selection, which runs to almost eighteen minutes, amounts to a suite, although not necessarily in the pre-Classical tradition of an assembly of dances. The opening movement of this suite begins with an impeccably blended trio for clarinet, saxophone, and trombone that has an almost folk-like quality. That “folk rhetoric” is then reinforced with the entry of the accordion, rather than a piano, as one of the rhythm instruments. The remaining tracks on the album are comparatively short. This recalls Cecil Taylor’s approach to many of his solo concerts, beginning with one extended continuous piece (often going through a variety of different phases in the sort of “suite” structure encountered in “Time Is The New Space”), followed by a series of much shorter works. For Goldberg, as for Taylor, the initial lengthy sections basically lay out the landscape of approaches to harmony, counterpoint, sonorities, and overall rhetoric. Once that landscape has been established, the listener is then invited to return to specific regions, so to speak, for a more “informed” visit. The advantage of a recording is that it allows the attentive listener to get to know that landscape better; and Vol. 1: The Humanities is definitely music for such listening, rather than plugging into a portable device to become part of one’s “daily soundtrack.” As with any good jazz recording, these are tracks that reveal new features to the listener with memories of previous listenings. After all, if one does not come away from a subsequent listening experience with some new insight, why bother having the recording as a resource in the first place?